Now that the kitchen tiling is about 85% done (I can’t finish until the radiators are disconnected in the spring), I’ve started making final decisions about the lighting and shelving that we’ll be putting up. As fun as it is to have all of our food sitting on the dining room floor, I’d really like to be able to organize my dishes and current pantry contents onto shelves, and get the food into the pantry. There’s only a single ceiling box in our kitchen right now, and that’s how it’s going to stay for the foreseeable future. For the past 7 years we’ve had an older version of this fixture from IKEA, and…it’s just ugly. I never thought it looked nice, but it was a way to quickly and inexpensively get multiple overhead light sources going, and it was a vast improvement over the rusted-out ’80s contractor special that was there when we bought the house. It’s time to move on, though! 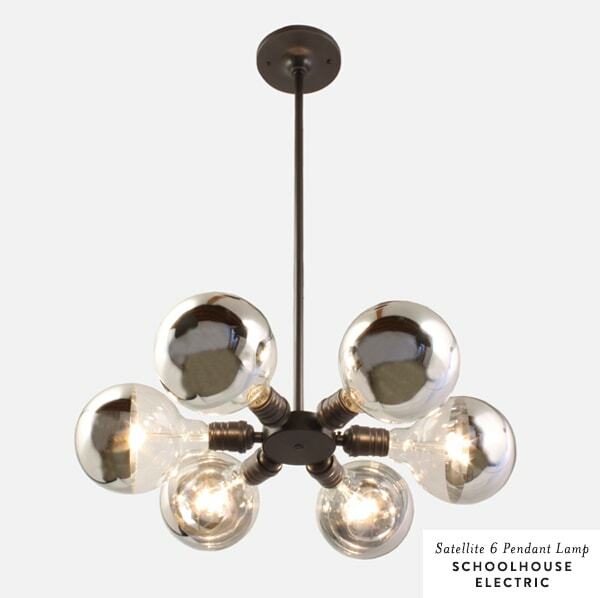 I first fell in love with Schoolhouse Electric’s Satellite 6 pendant when I saw it in Victoria’s dining nook (scroll down!). Six lightbulbs is a lot of lightbulbs, especially when each socket is rated for up to 100 watts. Since the bulbs are exposed on top, I’ll also benefit from the lights reflecting off of the ceiling, something my friend Martha was smart enough to suggest I look for in a fixture. Victoria also suggested putting the light on a dimmer switch, which I think is a great idea. I’m not sure whether I’m going to go with the natural brass or antique black finish, though. I think either would look at home. Since we’ve done away with the upper cabinets and I don’t want to have lighting mounted under our new shelves, I thought putting an adjustable wall arm sconce on the wall to the left of the stove would be a smart move. I can swing it toward the stove or the countertop depending on where I need some direct light. 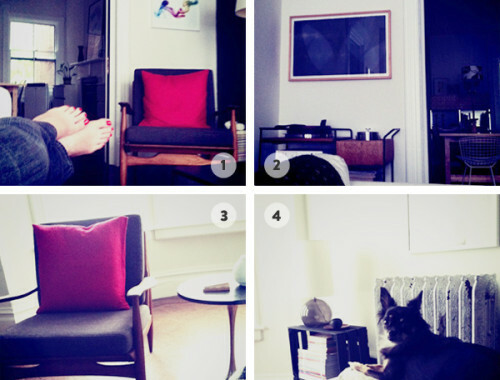 I’m really into the Otis lamp from onefortythree. And finally, the SHELVES. 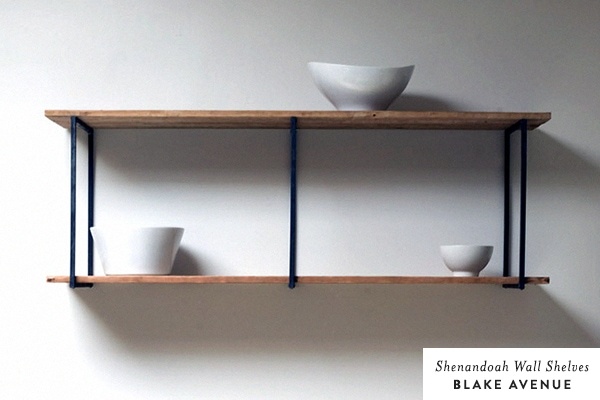 Last week I finally placed a custom order with Blake Avenue for two sets of their Shenandoah wall shelves. They’ll be made to perfectly fit in the space above the sink and across the entire wall above the unit on the left wall. Aren’t the brackets beautiful?! I didn’t want to have to leave space above the tile for a standard bracket, so I’ve been looking for something like this for ages. I can’t wait to see them. Next up on my kitchen checklist are paint and wallpaper!! The view(s) from my sofa. Anna, you may have solved a problem my husband and I have been having in this apartment for YEARS! Affordable and nice non-hard-wired (swag) fixures! We have a couch in our bay window that fits perfectly in it’s niche, but no room for a side table or lamp. 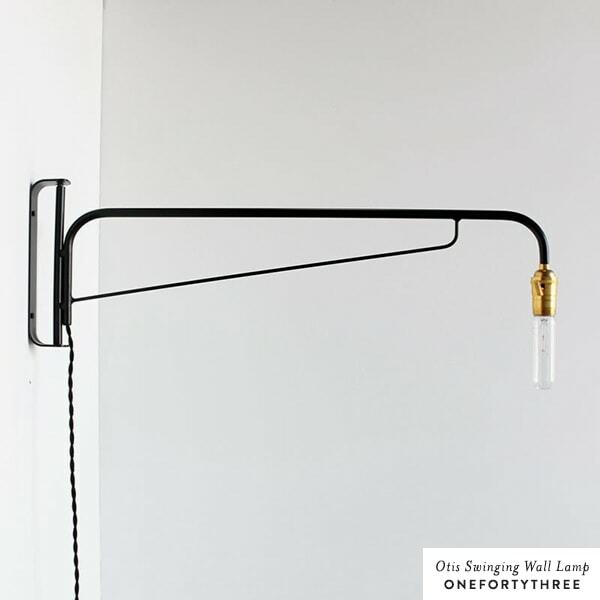 I am constantly scouring vintage shops for the right swag pendant, but now that I’ve seen wall-mounted fixtures from onefortythree I think I know what I have to do. Awesome. That shelving is lovely, too! I love that you have a spot for the dog bed! Positioned so Bruno can nap in close proximity to any food that might fall while I’m cooking! This is probably a stupid question, and it may have been asked already, but how is your vent hood system set up? 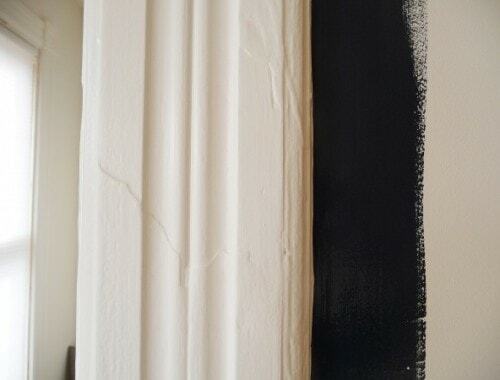 I know you recently painted black, is that where it is? Just wondering 🙂 Also, I love the style of lighting you’ve chosen, the pendant and lamp is beautiful. Hmmm…I should do that too. I never cook. Haha. I cook a lot, but seldom over high heat or with enough oil to spatter or smoke. Great fixture choices! I’ve been trying to find a sconce for our kitchen to put over the sink. 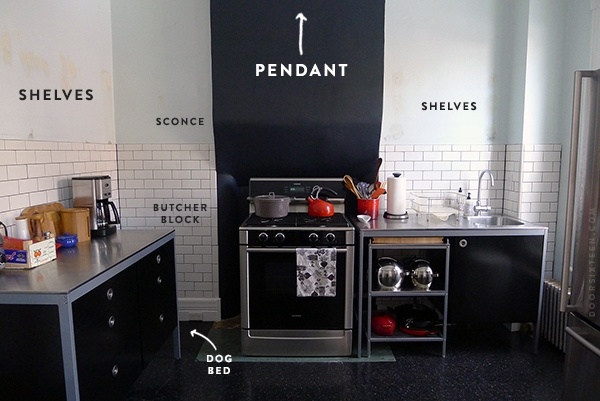 The idea of having something movable is pretty swank. The fixture reminds me of the Prouve sconce by Vitra but i’m guessing more affordable. Nice find! 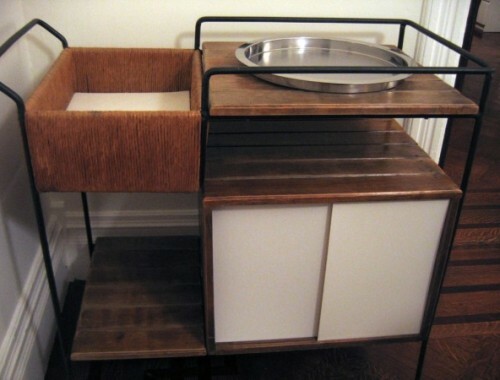 Definitely a higher price point than an IKEA hack, but maybe a little more elegant and less bulky! Watch out, if you get a cheaper version of this lamp, the plastic brackets isn’t the sturdiest. Too much stress, and it’ll just shatter. That happened to me, and I have yet to figure out what to do with the lamp now. Tim, are you referring to the IKEA lamp Tricia linked to or the Tolomeo lamp I mentioned? I’ve got a couple of the IKEA lamps in my kitchen. I mounted them to the wall for a while, but since the last paint job, they’re clamped to shelves over the counter. I love them, but then, I despise overhead fixtures. And Tim, your comment has inspired me to try making some wooden brackets! Oh, please pick the brass finish for your Schoolhouse Electric fixture! The black would be fine, but how the brass would POP! As I was reading down through this, I kept thinking: “I wonder what color she’s going to paint the walls?” So the cliffhanger at the end was definitely appropriate. Beautiful choices though! It’s going to be interesting to see it all tied together. Love where this is going Anna! I love love love that onefortythree lamp and keep on trying think of a convincing argument I could make to the boyfriend for bringing yet another lamp into our house besides the obvious “it’s really awesome” one. I’ve been eyeing the factory satellite three for our kitchen because I’m dying to replace the 4 bulb broken blades fan/overhead light in our kitchen (trust it’s as glamorous as it sounds) but worried about it providing enough light. You have to let us know how the 6 works out once you have it up! Caitlin, I was kidding about the 100 watt thing. Yes, that’s the rating, but I’m pretty sure I don’t need 600 watts of light beaming down from my kitchen ceiling. 😉 I’ll most likely aim for 40 or 60 watts per bulb, or the equivalent in the new halogen incandescents. I am not a fan of the currently available CFLs, but I’m sure we’ll see more attractive options (in both bulb style and the light emitted) in the years to come. I just got the City Chandelier 7 from School House Electric. We have it in a pretty large room and it is a LOT of light. Thankfully we already had a dimmer installed because I think that it would blind everyone in the room. Even if you purchases the lower wattage bulb you will probably want the option of dimming it down especially for those days when your kitchen is a little on the dirty side! Their pieces are so beautiful and I am really glad we splurged. It fits well with our 1880’s row house. Totally recommend. I’m a BIG fan of Schoolhouse already! I have multiples of their fixtures in my bathroom, bedroom and my guestroom. 🙂 They’re so beautifully made, and tie together the old and new elements of my home so perfectly. Yeah, I’m sure we’ll put in a dimmer. Sometimes it’s nice to have the lights low even while you’re cooking, assuming it’s a simple meal. I second putting the pendant lamp on a dimmer switch. I installed a lovely light with four big bulbs in my kitchen, which came with a dimmer. I originally planned to replace the dimmer, but it has been super useful. Especially because all those bulbs get hot! 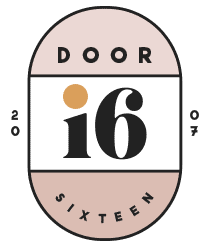 If you like I would custom design and handprint wallpapers for you. You could also have textiles and cushions printed with exactly the same silkscreens and colours. Have a look at my website and look if you like my designs. that lighting is TO DIE for! I totally love the tiles. UGH! I’m so, so unbelievably jealous! I wish someone would just do something, or really anything, about my kitchen! Definitely not me! I feel so tired just thinking about it. Which is really embarassing, since I’m an architect. I don’t want to desing the stupid room, I don’t wan’t to chose shelves or colours or anything, I just want it to be different. Oh well, I guess in the end it will have to be me, won’t it? Hell! Oh Anna, I can’t wait to see those shelves up, they are so beautiful. Also, I love the one forty three lamp. I was wondering if you were still planning on using the carravagio lamp and the embossed wallpaper. Somehow, I can’t wait to see your kitchen done, kind of living through you on this one since I am a renter! Have a glorious 2013! Mariane, I’m going to use the Carravagio lamp somewhere else in my house instead. It would have been great in the kitchen in multiples, but since we just have the one ceiling box for now, I think it’s better that I use something that gives off more light. Oh, those shelves are EXACTLY what I’d like for this cottage we’re working on… but it’s a shared space, and I’m pretty sure my SIL will hate them. (Never mind the extra $$…) It’s sometimes hard to be a thoroughly modern millie. Boo! Hiss!! The dog nook is the best idea for a kitchen I’ve seen in a while – after tripping over my dogs a few too many times I finally taught them a command to get out of the kitchen – but they peer at me from the doorway and it would be so much better if they had a place in the room yet out of the action. Those shelves are so elegant and so perfect for you and the space. Can’t wait to see what you do with them! Hi Anna; I was wondering after seeing some of your previous kitchen posts, whether it would be an option for you to paint the wood around the windows in your kitchen black(ish)? Because that was (in my mind) the most striking element in the pictures of the Victorian kitchen, and it comes back in the kitchen in Barcelona (I really like it in the given context). Although I love the swinging wall-lamp as a lamp, it does seem pretty inflexible for this place (it will only illuminate one spot on both counters), but I might be mistaken in my interpretation of the space. Have a wonderful day. I am so picky about shelving and those are a-mazing. Everything is looking so good! SHELF LOVE! I want to see a tom dixon pendent in there. It would look perfect! I love all of Tom Dixon’s lights, but unfortunately a single bulb isn’t enough to illuminate the room enough. Oh, those shelves are perfect. So excited for your big reveal! Anna – this is looking so amazingly good!!!!!!! Perfect additions to the space! Me and my wife, we are so much into shelving for our reading room and kitchen. We nearly upgrade our reading shelves twice last year. The shelves you showed in images are simple and amazingly attractive and so does the lights.